★ The perfect gift for any wine lover assembled by our designers and ready to be sent to your loved one. ★ PLEASE CHOOSE "This item is a gift" at check out to add a personalized message for free. This will ensure gift is double boxed. ★ The box contains a cozy (and hilarious) pair of socks. 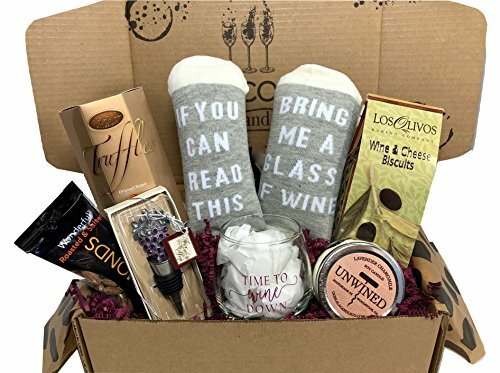 "If you can read this, bring me a glass of wine!" ★ Also included: a custom stemless wine glass that reads "time to wine down" in gold. A unWINEd lavender and chamomile soy wax scented candle from our favorite brand Ooh La La. If you have any questions about this product by Hey, Its Your Day Gift Box Co, contact us by completing and submitting the form below. If you are looking for a specif part number, please include it with your message.